If you’re familiar with my culinary ramblings, you’ll recall that I have a soft spot for the cuisine of the atomic age: casseroles, Jell-O, turkey divan and such. And until recently – like yesterday – I had thought that this kind of food had met a fate similar to that of Latin: more or less dead and just kind of limping along in places no one wanted to go, like church services and criminal court. Well, it’s easier to come by than you might think, and I’m big enough to admit I was wrong. In fact, after two days at the trough in Ohio I’m also big enough to land a fighter jet on. That’s correct, I’ve just finished up a mini-tour through the heartland where the trees are turning, the air is clean, and the folks are unfailingly friendly. Unfortunately the coffee is thin, the gravy is white and apparently the Velveeta runs like a river through the entire region. Now, I have it on good authority that there is plenty of good food to be found in corn country, but I cannot honestly say that I encountered much. I went west, or west-ish, anticipating crispy funnel cakes, old fashioned drive-in restaurants and tasty apple pie which should have been as common as, well apple pie in the Midwest in October. I found none of these things. What I did find was a whole lot of large portions of meat and wads of stodge smothered in American cheese product or dripping with glutinous white sauce. Just yesterday, in the throes of a blood sugar crash and driven by desperation, I pulled into a joint called Porky’s Drive In for lunch. Noting the numbers painted on the parking spaces, I was optimistic I might see a waitress on roller skates with a tray, but was sadly disappointed. Counter service only. Perhaps they offer valet parking in the evening. Super nice folks run the place, and it has a pleasingly retro, laid back vibe, but it was only by the skin of my teeth that I narrowly averted a colonically disasterous encounter with their pulled chicken sandwich. Imagining the poultry equivalent of pulled pork, I inquired as to the recipe and was told it was shredded chicken bound with cream of chicken soup. Tempting to be sure, but I opted for the Velveeta topped burger instead. It was tasty, but as with so many childhood favorites, the reality of the Velveeta fell far short of the memory. But that’s why God, in His infinite wisdom, gave us the knowhow to invent ketchup and mustard. Needing a vegetable, I ordered the onion rings, but found them just a little on the tough side. It’s a sad day indeed when onion rings disappoint. Oh well, the tour is over and I’m back on the right coast – and not a moment too soon if my gastrointestinal tract is to be believed. Still, on the bright side, all this has put me in mind of my childhood and those heart attack inducing, artery clogging meals of yesteryear. And of the book that gave rise to them all. Of course I’m talking about Betty Crocker’s Picture Cookbook, first released in 1950 and the homemaker’s bible for many years hence. In my mother’s kitchen it was the lone cooking reference on the shelf, and the only thing that even came close to the unopened jar of mint jelly on the refrigerator door for longevity. My family never had lamb, but we were ready, and if we’d wanted it, we had only to look to Betty to tell us how to buy, prepare, present and eat it, complete with lurid Technicolor photos and relentlessly cheerful commentary. Our family’s original edition, given to my mother as a wedding gift I believe by none other than Grammie Sue, is long gone, but I have a reprint (now looseleaf bound) and it is a lulu, let me tell you. 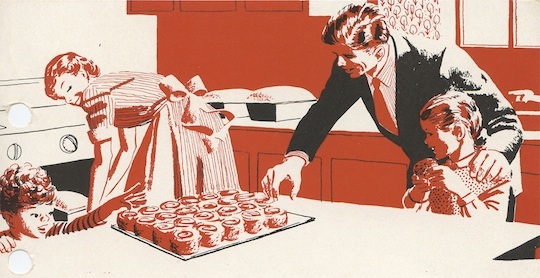 If you like a good retro cookbook, run, don’t walk, to your local bookstore and grab a copy. Or, if you’re too full of cheese fries to waddle over, you can always order it from Amazon or Walmart. In it you’ll find such crucial information (under “Special and Foreign Foods”) as how to make “a la king,” a rich cream sauce often with mushrooms, green pepper and pimento. Sometimes sherry. In other words, beige ooze that looks like someone already ate it. I’m pretty sure no foreigner ever whipped up, let alone consumed, that stuff, but maybe it qualifies as special in some way I can’t quite fathom. In the list of cooking terms, I like the explanation of “try out.” It means to fry solid fat or fat meats that have been cut up in small pieces until the fat is separate from the membrane. Yum! 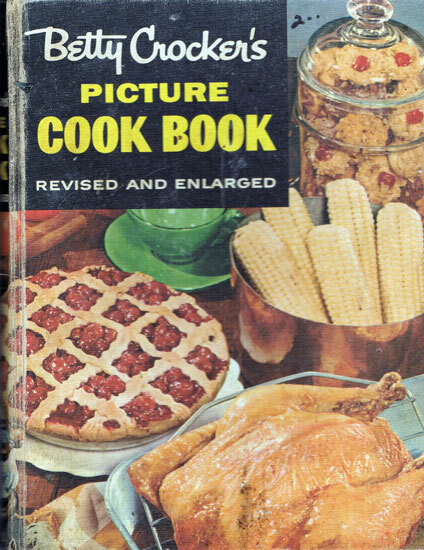 Each time I look through the book, it strikes me that cooking in the 50s, for all it’s cans and miracle time savers, was a lot more, how shall I say, earthy than it is now. Molded salads are on page 348, and by now I think you know how I feel about Jell-O. And of course, my favorite section, “Beauty Touches for Pies” can be found on page 307. Smothered Chicken is on page 283. It is preceded by the appealingly named Ground Meat Crust Pie on 275. Is your mouth watering yet? No? Well that’s just because you haven’t seen the recipes for the “mocks” – chicken loaf, drumsticks and duck. It’s not entirely clear to me whether we’re supposed to fake it or laugh when it’s over, but it being the 1950s I’m going with the fake. Lest you think it’s all standard American fare, Betty also offers up some “exotic” dishes, like sub-gum and curry, though the contemporary palate may find these just a tad under-spiced. But my all time favorite, the dish I dream about, is the unforgettable Tuna and Potato Chip Casserole on page 394. Essentially it calls for you to dump two cans of tuna into a casserole dish, then layer over it two cups of crushed potato chips, three cups of white sauce and some sautéed mushrooms. It only needs a half-hour or so in a 350 degree oven, and you’ve got “a perfectly grand dish for a women’s luncheon.” Yes indeed, heaven on a plate. Hungry yet? I know I am. Pass the carrot sticks, please. No really, I’m begging you. Posted on October 12, 2011, in Cooking and tagged Betty Crocker, Cookbooks, Humor/Commentary, Velveeta. Bookmark the permalink. 15 Comments. You know, I have never been able to muster the courage for this particular delicacy. You are a brave man. Somehow I missed DollarAScoop. Can’t imagine I’ll be putting it on my must-visit list somehow, but thank you for altering me. Eat the food. Pay your bill. Walk out. And you are my all time favorite reader. Just like that! Glad you stopped in and that I found your site. I am a follower. You are WAY too kind. Looking forward to clicking around your site as well. 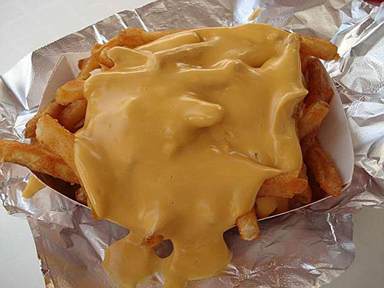 The only right way to eat fries with cheese is poutine. Never tried poutine, but I hear it’s fantastic. Thanks for stopping in! Okay, but my mother made a rice, ham chunk and cheese casserole that she swears can only be made with Velveeta. I’ve tried it, and I have to say it totally held up to the test of time. And my sister (an excellent cook) made it with high quality aged cheddar and said it was not as good. There is a place for velveeta, and it’s not just super bowl sundae dip. Mais bien sur, Velveeta has its place, and I suspect next to a ham chunk is one of the better ones. You know how I love a casserole. It’s Velveeta as a lifestyle that worries me.